Goa is a historian’s delight with so much of its history still being unravelled. The legacy of the Portuguese rule has been a heritage of unique standing. The Tertiary Carmelites, not to be confused with the Discalced Carmelites reformed by St Teresa of Avila, are an integral part of Goa’s past. Today, the ruins of the monuments connected with this order lie open to desecration and looting with impunity. Much less regard is offered in terms of a study and preservation of this significant historical site. The Tertiary Carmelites are in fact one of two indigenous priestly orders that welcomed Goan vocations to the priesthood. The Jesuits and other religious orders did not display a favourable attitude towards Goans, which led to the requirement of congregations that would be open to the natives of Goa. The Oratorians of Philip Neri, which came into existence in the 1680s and was recognised by the Vatican in 1707, was the first Goan priestly congregation in Estado de India. However, the Oratorians restricted themselves to the inclusion of Goan Catholic Brahmins. The secular priests of the chardó caste who wished to be part of a religious community had to found a religious order for themselves. 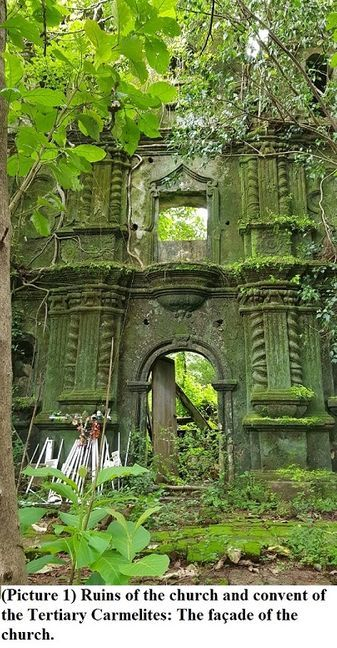 This resulted in the Goan priests João Baptista Falcão, José da Apresentação, and Francisco Xavier dos Anjos building a hospício (retreat) in Chimbel between 1747 and 1749 which was consecrated to Our Lady of Mount Carmel and called Soledade da Nossa Senhora do Carmo. The order was formally recognised in 1750 as the Congregação dos Terceiros Descalços da Bemaventurada Virgem Maria do Monte do Carmo (Discalced Tertiaries of Our Lady of Mount Carmel). Soon the hospício became a convent, and a church (Nossa Senhora do Carmo) was built with its façade facing southwards, a short distance from the road between Ribandar and the parish church of Our Lady of Livra-fevres. A seminary was added to the complex as the numbers of the congregation grew in the latter part of the 18th century. In the early 19th century, the order came under fire through Archbishop Fr Manuel de São Galdino. The Archbishop declared the Tertiary Carmelites schismatics, originating the Cisma de Chimbel (Chimbel Schism) that took place between 1815 and 1819. The congregation was reduced to 20 friars and 3 lay brothers by 1835 when all religious orders had been suppressed in Goa. Eleven of the clergy sought refuge at what was once the retreat of the extinct Franciscan Observant Order – Our Lady of Pilar (near Goa Velha). Cirilo da Anunciação was the last friar of the Tertiary Carmelites, and he died in Pilar in 1887. The convent and the church of the Tertiary Carmelites were in 1841 taken over by Santa Casa da Misericórdia. The following year, women from the Recolhimento de Nossa Senhora da Serra (orphanage for girls) and the Recolhimento de Santa Maria Madalena (shelter for women of ill repute who had reformed and poor, old widows) moved into the convent. The church began to be known as Igreja da Misericórdia or Igreja de Nossa Senhora da Serra. In 1924 the inmates of Recolhimento de Nossa Senhora da Serra were moved to Panjim while the Recolhimento de Santa Maria Madalena continued to function in Chimbel for a few more years. The headquarters of Santa Casa da Misericórdia were subsequently moved as well. The Misericórdia’s Asilo dos Alienados, or lunatic asylum (Goa’s first psychiatric institution), was instituted at the convent at Chimbel in the 1930s. Some repair work was done on the old structures along with new constructions. The Provedoria de Assistência Pública in 1947 supplanted the Misericórdia which was mismanaging the charitable organisations under its fold. A home for the aged and destitute was later operational on the premises at Chimbel by the Provedoria. A new old age home was completed by 1982 a short distance away from the old convent buildings. 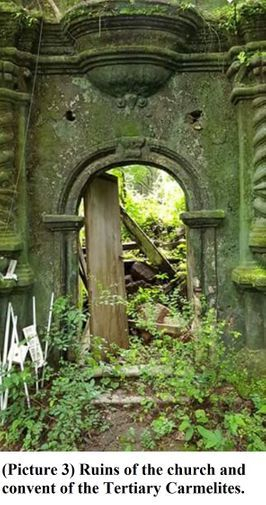 The convent structures and the church from then on began a steady descent into decay that has left behind a dilapidated convent, where nature has begun to reclaim the structure, and an imposing church façade. 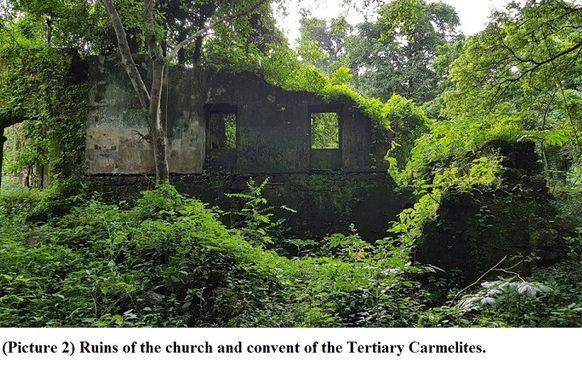 There is still much to learn from the architectural remains of the Tertiary Carmelites’ church and convent at Chimbel: information that will serve to enrich the Goan history archives. 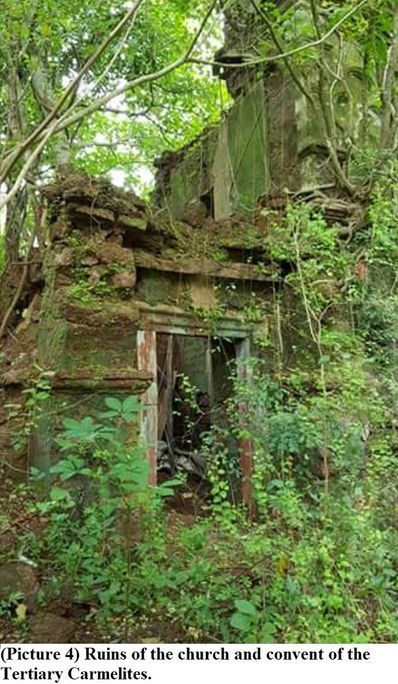 The stamp of a heritage site is much deserved by what remains of the Tertiary Carmelites’ prominent historical legacy as the first Goan religious order to eschew pandering to race and caste preferences.